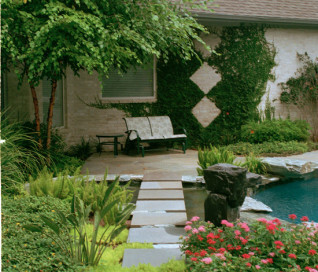 Last summer, a Houston couple by the name of Turner called us and asked us if we could design a landscape out of natural materials that would also reflect their passion for collecting abstract and contemporary art. They wanted a garden water fountain and colorful vegetation that also combined certain aspects of the irregular geometry that characterizes abstract art. They wanted a very subtle blend of regularity and irregularity, and a combination of curved and linear elements that would suggest a natural sense of movement from the edge of the property to the back of their home. We began our work by constructing a garden water fountain at the very end of a brand new swimming pool the Turner’s had just had installed. We built the basin in the shape of distorted figure-8 that bent to the left and right of what would ultimately become a walkway over the water. We used a gunite concrete substructure that would seal the basin and keep it waterproof, and then we concealed the top of the concrete with a decorative stone-clad overlay whose blue-gray color complimented that of the home. When we finished it looked like a small stone well filled with clear, running water that drained into the pool on one end. On the same side of this drain, we built a stone sculpture out of three stones planed into cubes. The cubes were piled one on top of the other, so that when the structure was complete, it looked like a sculpture made from boulders on some far Pacific island. The water rose out of the stone at the top and flowed down all four sides of the sculpture into the pool. The new water fountain and surrounding basin now gave us an ideal center point around which to plant a flower garden replete with a number of species. On the left, we planted Mexican sedum to add a lime green contrast to the surrounding landscape, and we planted golden globe to provide flowering ground cover. To add a three dimensional element to the garden, we planted foxtail ferns to provide year-round greenery, and bird of paradise for its resplendent, seasonal blooms. Farther back from the fountain itself, we planted a river birch tree that framed the entire garden from the vantage point of the pool and added an additional aesthetic at night as a backdrop for up lighting. 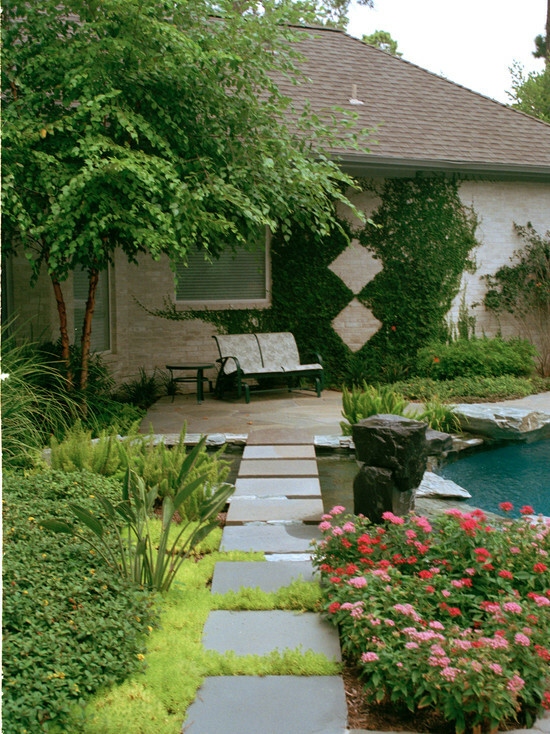 To emphasize the unique aspect of our water garden fountain we planted pink and red pentas on the right that drew the eye upward toward the stone sculpture, and we trained a vine to grow up the far wall of the home that would mirror its unique cubic design. We then completed the project by building a walkway that led from the front of the property to the home. We constructed this walkway out of stepping pads that actually float on water. This allowed us to build the walkway straight over the water in the center of the garden. We deliberately used this design in order to blend regular material with irregular material. The stones move in a progression from asymmetry to symmetry the closer you get to the house. The very first stepping stone has only two straight sides, for example, and the second has three. 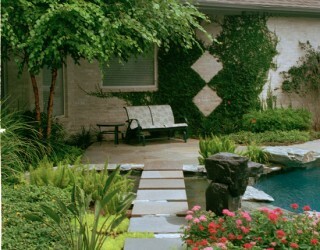 Each stone that follows becomes increasingly square as it passes over the garden water fountain until it finally reaches the back patio of the home.